There is a new theory that “sitting” is the new “smoking” in terms of negative health effects. That is a pretty bold statement when you consider the deadly consequences of smoking. And sadly, anyone who has an office job is likely sitting for at least 6 hours a day, not including any “relaxing” time at home in front of the TV after work. And, if you happen to work in the telecommunications industry, you are actually spending up to 12 hours sitting every day! Figure in an 8-hour sleep and you are only on your feet for 6 hours in a 24-hour day. That’s pretty startling when you actually think about it. This does not even include the other health issues such as obesity, heart disease, diabetes and even brain damage just to name a few of the other negative effects caused by endless sitting. It can also help improve cardiovascular health, including lowering blood pressure according to a study published in The journal of Diabetology & Metabolic Syndrome. (9) And obviously, for people who sit all day, yoga is amazing for stress, lower back issues and pain in general. While you may not be able to do much about having to sit during your job, there are a few things you can do to counter the negative effects using yoga—and here are 8 of the best yoga exercises to help you get started. This pose is one of the simplest and most effective yoga exercises and should be the one you start and finish with. It not only helps stretch your back but as well, your legs. This pose is great for releasing the pressure of scrunching over a keyboard all day. The mountain pose is the foundation for all of the standing postures and can greatly improve your overall posture and stability. It is also used to open your chest and back. Start by standing in a comfortable position with your feet hips-width apart. Next, bring your hands up over your head with your palms facing forward and your thumbs hooked as you bend gently backward as you breathe deeply. From the mountain pose, exhale forward hinging at the hips. Bend your knees enough to bring your palms flat to the floor and your head pressed against your knees. Feel your spine stretch in the opposite direction as you pull your head down and in and press your hips upward. Work on straightening your legs in order to deepen your stretch in the backs of your legs. Breathe and hold for 4-8 breaths as you concentrate on pressing your belly into your thighs as you inhale. To release the pose, bend your knees as you keep your back straight. Inhale as you move your arms out to your sides and then bring your torso up back into Mountain pose. If you can’t go all the way, use a support to lower yourself as low as possible. If you spend a lot of time hunched over while sitting, this is a great pose to stretch your lower back and relieve any back pain. It also helps to strengthen you core muscles. Start by lying on your stomach with your toes flat on the floor and your forehead resting on the ground. Make sure to keep your legs close together, with your feet and heels touching. Next, place palms on the floor straight under your shoulders while keeping your elbows parallel and close to your torso. Pull a long, deep breath in and slowly lift your head, chest and abdomen as you essentially try to keep your belly-button on the floor. Pull your torso back and off the floor with the support of your hands. You should look like a Cobra with its hood raised, hence the name of the pose. Try to hold the pose 15 to 30 seconds as you breathe easily. As you exhale, release the pose and go back down to the floor. Downward facing dog is one of the most known yoga poses. It is a standing pose and mild inversion that builds strength as you stretch your entire body. Start out on your hands and knees with your wrists directly under your shoulders (your fingers stretched apart and pointing toward the top of the mat) and your knees directly under your hips. Firm your hands down, pressing through the outer edges of your palm and your fingertips. Tuck your toes under keeping your feet hip distance apart. As you exhale, draw your belly-button back toward your spine, pressing the floor away from you as you lift your hips back and up to push yourself back into an upside-down V pose. At first, you can keep your knees bent slightly, but as you progress, you will need to straighten your legs. Press your upper arms toward each other with your shoulder blades down along your spine. Align your ears with your upper arms. Relax your head—don’t dangle it, however. Look between your legs or toward your belly-button and hold for 5-100 breaths. This is a wonderful pose for your neck. It relaxes your neck muscles and improves postures, although it can be a hard pose for at first. Start by lying on your stomach and then grab your feet from behind to lift your legs and chest to form a “bow.” Stay in this position for as long as you can and then return to the starting position. The sphinx Pose is a beginning backbend in yoga that helps to open your chest, lungs, and low back. It is fairly easy and can allow you to focus on your breathing. It helps lengthen your spine and reduce lower back pain. Start by lying on your stomach. Place your lower arms on the floor with your hands facing forward to the top of the mat and shoulder-width apart. Raise you head and arch your back slightly. Hold the pose as long as you would like as you breathe gently in and out. This is a great way to loosen your neck after a long day of sitting over a computer or at a desk as well as prevent chronic aching from constantly looking down all day. The wonderful thing about this exercise is that it can be done anywhere at any time. Start by sitting in a cross-legged pose or if you like, you can do this standing. Next, lean your head to the right and then extend your left arm and hand toward the ground until you feel a deep stretch on the corresponding side of your neck. Breathe deeply as you stretch and hold for a few slow breath. Repeat on the other side. This pose if the best one for stretching your lower back and spine. It is another one that is great for pre- and post-yoga programs and can also be used for a stretching warmup and/or cool down in with any athletic exercise. Start with your hands and knees on the floor in a “tabletop position.” As you inhale, round your spine and curve it up like a cat. 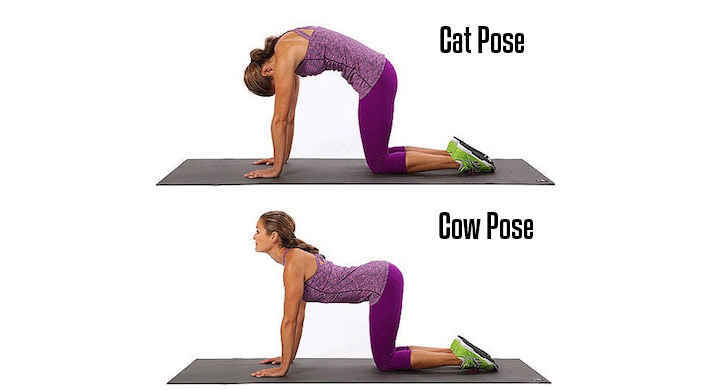 As you exhale, arch your back and lift your chest to make a cow pose (the opposite direction—push your stomach toward the floor). Do this slowly as you breathe as many times as you want. ← Cancer Dies In Just 42 Hours, This Juice Cure More Than 50 Thousand People!